One of the biggest rewards of growing carrots yourself is being able to choose varieties that have intense carrot flavor, special sweetness, or interesting shapes or colors. Carrots are one of the most popular root vegetables - they are delicious when little, and get even tastier as they grow. Many people intentionally plant carrot seeds too close together so they can harvest and eat the thinnings. The most common problem people encounter in growing carrots seems to be poor germination. I get a lot of questions about this. Usually the problem isn't actually poor germination itself (as in, “bad seed”), but rather that seeds start to germinate, and then dry out and die before they break the surface. Sprouting seeds can also die if the soil is too hard to push though, or if they get watered with too much force and become exposed on the surface. Watering with soaker hoses, fine-spray sprinkers or a fine mist by hand are all better during germination than heavy overhead watering. Let’s back up a bit and talk about soil in general. Carrots, having such long, straight taproots, need to be planted in a fine seedbed that is very loose, friable and stone-free down at least a foot (two is better). Start Indoors: carrots don’t transplant well. Direct-seed in ground 2-3 weeks before last frost. Plant Seeds: ¼” deep (or on surface, covered with 1/4" fine compost), 3” apart (or closer, then thin). Transplant: don’t. Direct seed instead. Thin: to 2” apart when 2” tall, to 3” apart when 3” tall. Crowding causes forking. Covers planting times, depth and spacing, and techniques to maximize use of space. 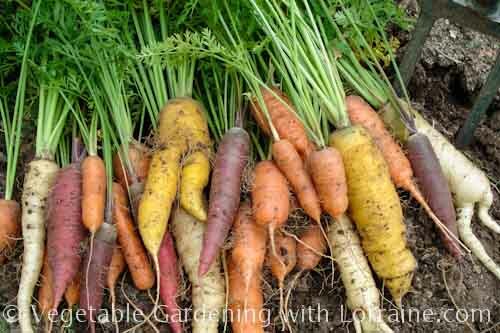 Planting carrots differs depending on whether you grow in rows or beds. And one of the most fascinating websites you'll ever find devoted to only one vegetable is the World Carrot Museum, a labor of love by a devoted Englishman named John, and a tremendous resource of carrot lore.